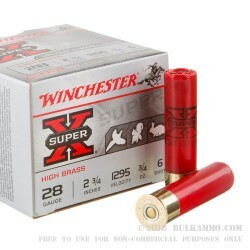 Dependable Winchester quality with the Super-X high brass series. 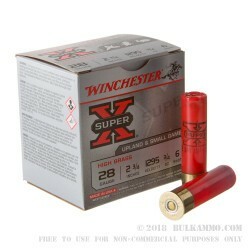 The Winchester Super-X line of shot shells are perfect for your next upland bird or small game hunting trip. For nearly 100 years the Super-X shell has been THE choice of experienced hunters everywhere, combining form and function with affordability. These 2 ¾” shells contain 3/4 of an ounce of #6 lead shot in a high brass design, allowing for greater power at long range. 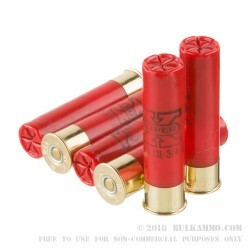 Using only the highest quality clean burning powders and primers, alongside a one-piece hinged wad, these shells deliver a muzzle velocity of 1295 FPS, allowing for tight patterns when it really counts-- on your next hunt. A quality manufacturer of firearms and ammunition for more than 150 years, Winchester is one of the most recognizable names in shooting sports. don’t hesitate and pull the trigger on some quality shot shells for your next hunt. Product comes 25 rounds per box.